Osaka, Japan - Panasonic Corporation will begin sales of its high image contrast transparent screen that enables the use of glass, such as shop windows, as digital signage on March 22, 2017*. 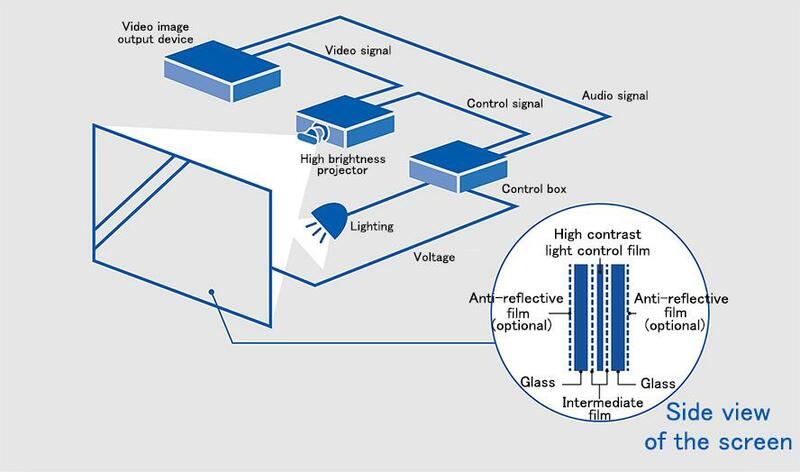 This product will include XC-CSG01G, a unique glass comprised of a high contrast light control film placed in between 2 sheets of glass, which when voltage is applied changes from the screen mode to the transparent mode, as well as XC-CSC01G-A1, the control box. Images are projected (from the rear) onto the glass during the screen mode. The control box will synchronously operate the projector and the screen per the image content, and change the screen mode from transparent to screen mode. During the transparent mode, it will serve as a shop window showcasing products and exhibits, and during the screen mode it can reproduce high resolution images on the glass to introduce information about new products or about various campaigns during the sale season, helping transform the show window into an even more captivating environment. Moreover, multiple screens may be combined to create one large screen. Panasonic will provide new visual solutions to mainly the distribution industry, public institutions and public facilities including commercial facilities, retail stores, hotels, airports, and museums. The demand among stores, shopping malls, museums, hotels, airports and tourist information centers for a captivating exhibition service using digital signage is on the rise. Panasonic has received many requests for a system that would be capable of displaying high resolution images as digital signage and blend into the exhibition environment when not in use to create an alluring environment. Panasonic applied the wealth of high resolution technologies it has fostered in the development of TVs and displays to create a transparent screen that could use the glass window as a high resolution signage and provide a clear view of products and exhibits behind the glass when not in use as a screen. 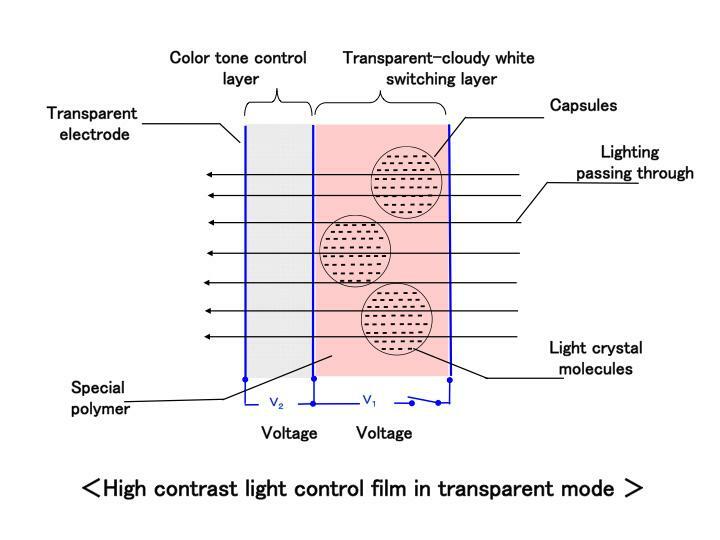 Panasonic has combined glass with a high contrast light control film, which is comprised of a transparent-cloudy white switching layer containing special polymers and capsules and color hue control layer. 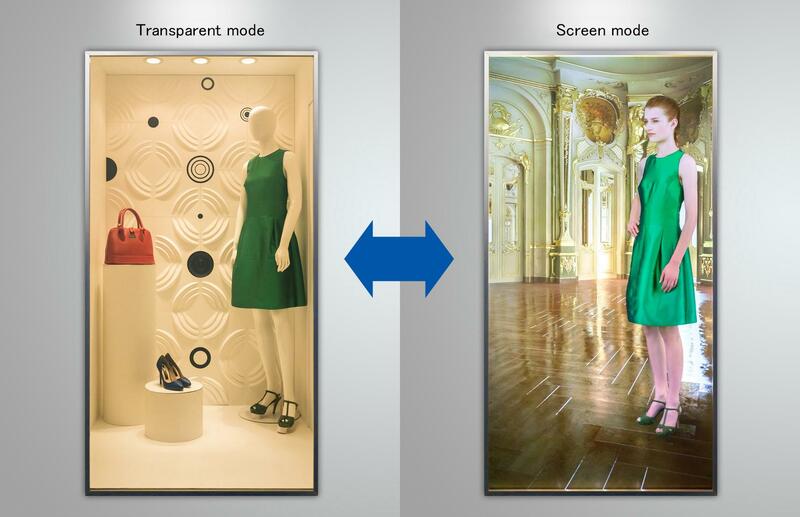 The color hue control layer will absorb a great deal of external light in screen mode, thereby significantly reducing image degradation and bringing to life high contrast images on par with digital signage, even in brightly lit environments. 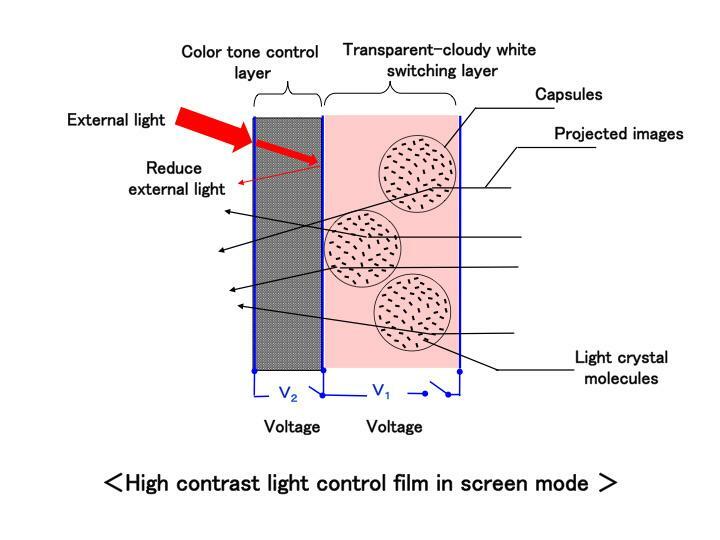 By adjusting the color hue control layer's permeability depending on the level of lighting in the installation environment, the screen can maintain the same level of high contrast in environments of varying brightness. 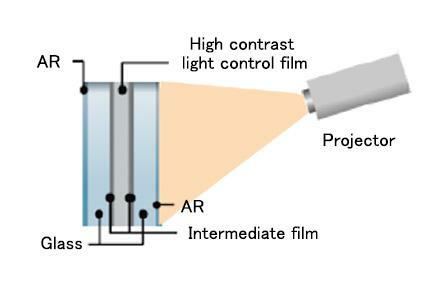 In brightly lit spaces, it can reproduce images with rich blacks, and in dark environments, it can reproduce high contrast images even with a compact projector. 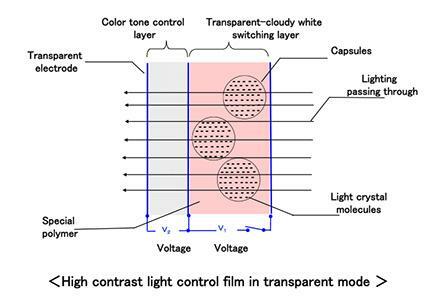 In the transparent mode, voltage is applied to the transparent - cloudy white switching layer which will give regularity to the arrangement of the light crystal molecules inside, thereby enabling the light to directly pass through. 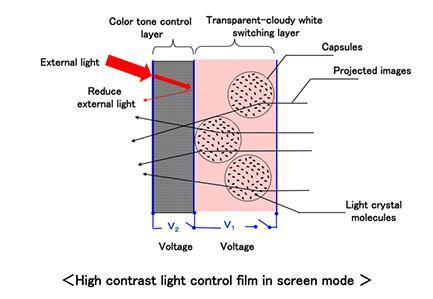 Moreover, by applying the maximum voltage to the color hue control layer, the permeability of the high contrast light control film will be improved. 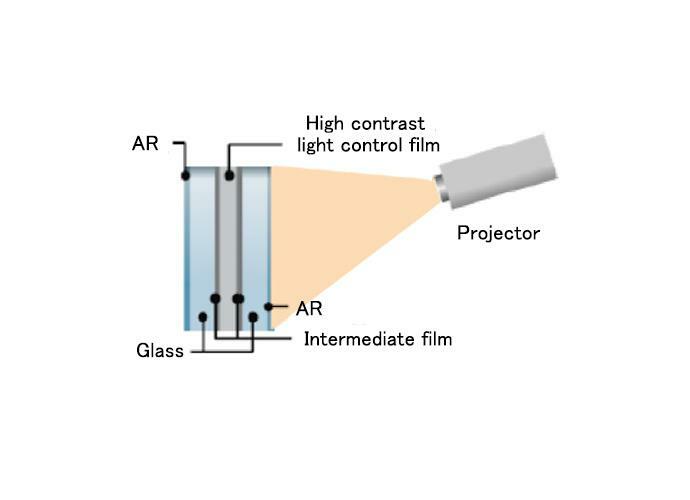 In addition, with the anti-reflective (AR) film (optional) on the surface of the glass that reduces unwanted glare, Panasonic has realized a permeability of approximately 68%. This enables the glass to serve as a shop window, giving a clear view of products and exhibits behind the glass. Numerous screens may be combined horizontally, so for example, a 221-inch (16:9) screen measuring 4.9m wide and 2.75m tall can be created. The control box will switch between transparent and screen modes, control the projector, and turn ON/OFF the lighting in the exhibition space behind the glass. *High brightness projector, Video image output device, and lighting are sold separately.